In many places, arcades seem to have nearly, if not completely, vanished. Yet, in Japan, they continue to hang on. As The Financial Times reports in a recent piece on Japanese arcades, there were 44,000 of them during their mid-1980s heyday. Today, the Japan Amusement Industry Association says there are 4,856 registered arcades across the country. There also another estimated 9,000 locales, each having under fifty machines. 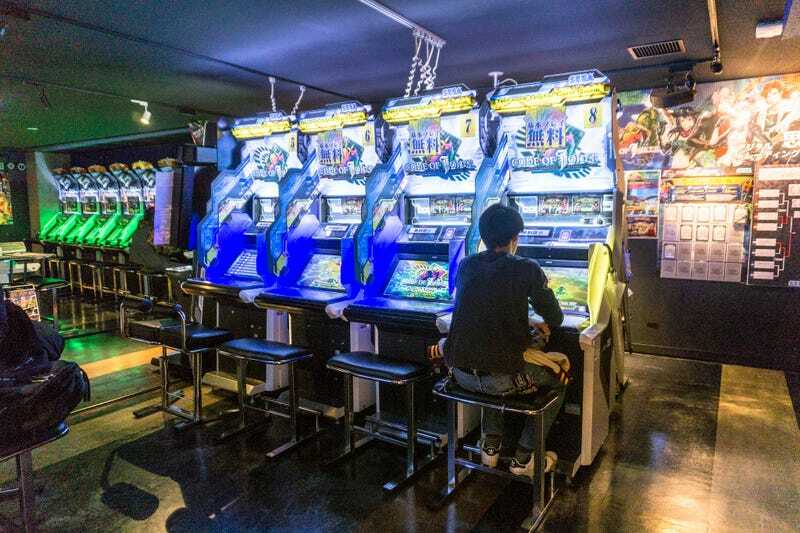 Even though there are fewer arcades now than in decades past, new games and cabinets continue continue to hit game centers, such as Dissidia Final Fantasy, Pokken, and KanColle, a title so popular that it drew lines upon release. Japanese arcades not only hang on, but keep getting new games. Here’s why. Arcade game makers own arcades. Some of the biggest corporate arcades in Japan are from Sega, Namco, Taito, and Capcom. All of those companies are also game developers, so they’re able to churn out titles for their arcades, whether that’s Namcoland, Taito Station, Plaza Capcom, or Club Sega. Since they’ve already invested in the arcade locations as a business, they need content to keep attracting customers. This integrated system is instrumental for Japanese arcades’ survival. Since many Japanese game makers got their start in arcades, that connection remains strong. It’s part of their corporate culture and identity, unlike in the U.S., where many game makers either got their start on consoles or on computers, and where famous arcade game makers of the past, like Midway and Atari, no longer exist. Infrastructure can make or break a business. In Japan, arcades are proof of that. Japanese arcades are part of the landscape. In Osaka and Tokyo, arcades are often located near major train stations. Thus, visiting an arcade is something you can do on the way to doing something else. You can pop in, play a few games, and go on your merry way. No wonder arcades are a way to blow off steam after work. It’s not only in big cities that you find arcades, but also in suburban shopping malls and rural areas. For standalone arcades, it’s important to be close enough to bicycle there to make up for foot traffic (that is, if they want to survive). In Japan, shopping mall arcades tend to be different from their American counterparts of the 1980s: the modern Japanese versions are bright and airy and aimed more at families with small children. The American arcades of my youth were not. Japanese arcades respond to trends. These aren’t only the trends regarding what types of games are popular, but also, trends among patrons. Since 2010, there have been reports of game centers being increasingly frequented by elderly customers. Some arcades offer their older customers blankets should they get cold, and Tokyo Gulliver, the Financial Times reports, has even lowered the sound for certain games and raised on other ones, specifically for these elderly gamers. The FT adds that the arcade has also rolled out softer chairs. This is just one example of Japanese arcades’ continuing responsiveness. What has remained constant is that Japanese arcades have always aimed to offer experiences that players could not get at home. This is a constant throughout Japanese arcade history. Take crane games, for example. They’re a carry-over from analog arcades, and yet another longstanding example of a unique arcade experience that is difficult, if not impossible, to replicate at home. The desire experience partly explains the rise of card-based arcade games in which players using (and collecting) IR-chipped cards and playing them on specially designed cabinets for an interactive experience they cannot get elsewhere. Arcades are not static. In Japan, they have changed over the years from department store rooftops of the 1960s to the game centers of today. The games have changed, too, with developers responding to the trends, decade by decade, whether that’s the shooting game craze, the fighting game craze, or the music game one. During the 1960s and 1970s, that meant carnival type games and electromagnetic arcade games. During the 1980s and 1990s, that meant better graphics and increasingly large, ride-like arcade cabinets. During the mid-00s, that meant hi-def monitors and collectible IR card games. If this year’s Japan Amusement Expo is any indication, what’s next is VR. Even as business becomes tougher and tougher, the Japanese arcade makers aren’t complacent, coming up with new and different ideas to not only stay relevant, but most importantly, to stay in business. Late last month, the annual Japan Amusement Expo got underway at Chiba’s Makuhari Messe, where the Tokyo Game Show is held. Taito showed off its latest deluxe train game cabinet, while Konami announced a new spin on Bomberman called Bombergirl. Even Koei Tecmo, which is better known for its console games, announced it was releasing a new VR system designed for arcades. It was exciting to see Japanese game makers continuing to back arcades. Yet, Japanese arcades won’t last forever. At one point, the last one will shut down. But today, there are thousands still remaining, and until that happens, players will keep playing and playing and playing. For more, check out The Financial Times.